Play the lottery with control, not guesswork! Creating Great lottery software is what we Do! ​Our company, Data Solutions, has been creating great lottery software for over 29 years. 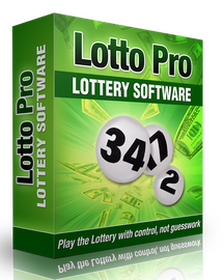 We have fine tuned and improved Lotto Pro lottery software over the years to the highly rated and trusted lottery program it is today. ​Discover today why our analysis tools are rated the best for making informed lotto choices! WORKS WITH MOST LOTTERY GAMES - Powerball, Mega Millions, Lucky for Life, Lotto America, Cash4Life, Pick 3, Pick 4, Pick 5, Pick 6, Pick 7 and Keno are all included. EASY TO USE - You don't need to be a "techie" to use the Lotto Pro. ​PICKS THE NUMBERS TO PLAY - A Smart Number Wizard automatically picks the best lottery numbers to play based on an analysis of the previous drawings. ​MAXIMIZES YOUR WINNINGS - Wheeling systems are included that provide a win guarantee, and may produce multiple tickets with winning numbers. SAVES MONEY - Lotto Pro allows you to apply filters that eliminate tickets with unlikely number combinations. UP TO DATE DRAWINGS - Includes accurate drawing histories for the United States, Canada, Australia, Brazil, Belgium, France, Germany, Greece, Hong Kong, Ireland, Malaysia, Mexico, New Zealand, Singapore, South Africa, Spain, Taiwan, Turkey and the United Kingdom. Lottery games for other countries can be added. WINDOWS COMPATIBLE - Lotto Pro is fully compatible with Windows XP, Windows Vista, Windows 7, Windows 8 and Windows 10. GUARANTEE - Lotto Pro has a 30 day no questions asked money back guarantee. Who better to attest to the value of Lotto Pro than those who purchased the program and use it on a regular basis. ​​Here's what some real customers say about Lotto Pro. Lotto Pro is a quality program. Three of my friends have bought the program on my recommendation. I have won $2000.00 playing the daily numbers games. I just wanted to write and tell you how impressed I am with your software. I won $98,000.00 playing the PA Treasure Hunt game using Lotto Pro. Your software is fun and easy to use and makes playing the lottery a blast. I would like to thank Lotto Pro for giving me the winning numbers for the California Fantasy 5 game. I split the grand prize with 2 other people. The amount I won before taxes was $165,270.00. I won $57,666.00 playing the Wisconsin Badger 5 game. I used the Smart Number option in Lotto Pro to create my tickets. I bought Lotto Pro a while ago and it has more than paid for itself, as it has given me several winners from the Ohio pick 3, Rolling Cash 5 and Classic Lotto games. First and most important I would like to say thank you for a powerful program that really works. My second day using Lotto Pro I won $498.00 playing the New Jersey Cash 5 game. Just a note to let you know I have used Lotto Pro for two years. I hit 5 out of 6 numbers recently playing the Hoosier Lotto, for a total of $3012.00. Keep up the good work. I'm pretty impressed with Lotto Pro. On only my second try, the program gave me 5 numbers which fell together in one line, with a prize of $1654.00. Thanks for your program and keep up the good work. I downloaded the trial version of Lotto Pro two days ago. I played smart numbers for the New York Midday game and hit for $10,000.00 (straight) and $200.00 (boxed). You can bet I'll be a regular customer. I won $2500 playing Georgia's Mega Millions using Lotto Pro. The statistical tools incorporated in Lotto Pro are quite good. Based on this app's picks, I recently won a second place in the New Jersey Pick-6 Lottery. It's help paying for a cruise! I won $25,000 playing the Ontario Daily Keno using Lotto Pro! Using your program, I used a 3 out of 5 full wheel and then filtered down and I won $428.00. This is the first time that I have won more than $35.00. I now let everyone know about Lotto Pro. Thanks for a great product. I just purchased Lotto Pro yesterday. I hit the New Jersey Midday Pick 3 game 4 times today (boxed). I just won $72,000 playing the California Fantasy 5 game with Lotto Pro. Thank you for a great program! I have been using your software for several years. I just hit the Ohio Pick 5 for $106,167. Thank you for a great product. I just wanted to let you know that tonight I hit 5 numbers on the Florida Lotto with Lotto Pro using Smart number generated tickets. Me and my wife have won approximately $21,624.00 using Lotto Pro. Your program has given us the extra money we have been looking for to enjoy a few extras in life. We win so regular that the lottery agent knows my name! I have been using Lotto Pro for some time now and I believe it has helped me in gaining an edge. I have had a $2500.00 win and several $250.00 wins. These are wins that I credit to using your program. Click the DOWNLOAD FREE TRIAL BUTTON to download a 15 day trial of Lotto Pro lottery software. No email or credit card required. Includes up to date drawing histories for the United States, Canada, Australia, Brazil, Belgium, France, Germany, Greece, Hong Kong, Ireland, Malaysia, Mexico, New Zealand, Singapore, South Africa, Spain, Taiwan, Turkey and the United Kingdom. Lottery games for other countries can be added.